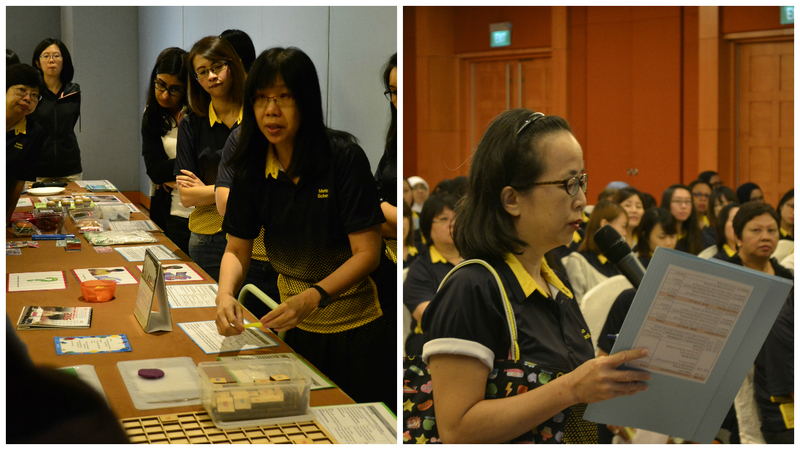 With the theme “Staying Rooted, Soaring High”, the SPED Learning Day 2015 is held on 16 October 2015 at Resorts World Sentosa. Programmes for that day include a decentralized ‘School-Based Learning’ programme in the morning and a centralized programme for all SPED schools joining together in the afternoon. Keynote sharing entitled “ From Creative Teachers to Creative Students” by Dr Ng Aik Kwang. His presentation is on cultivation creativity of Asian classrooms. During the session, he shared on the four Ps of creativity- Product, Process, Person and Press and the Model of Creative Problem-Solving. Examples of creative products and creative lesson plans are demonstrated in video clips. He encourages the audience to be creative teachers, As teachers, it is their responsibility to create a conductive environment for learning, create climate of learning in the creative class where students are to engage in creative learning and problem solving. Concurrent Sessions conducted by teachers from both schools. Topics include A Practitioner’s perspective on Health & Fitness for people with special needs, Universal Design for Learning, CCE Lesson Study, What works in teaching children with ASD, Numeracy Curriculum, Making Maths Real. All staff are to attend 2 sessions and from their reflection, it is believed that they have benefitted a lot from the sharing, which will enable them to be more competent, resourceful and professional. The afternoon occasion was graced by the presence of Acting Minister for Education (Schools), Mr Ng Chee Meng. Pioneer personnel who contributed to the SPED sector are invited to share the achievements and joy. There are also performances by staff, Principals and MOE SEB officers as well. Awards for Masters Scholarship are presented. All participants are treated to a sumptuous lunch while enjoying the various segments of the day, interacting with their peers from the sector and sharing the ‘fruits’ of hard work for the SPED children. 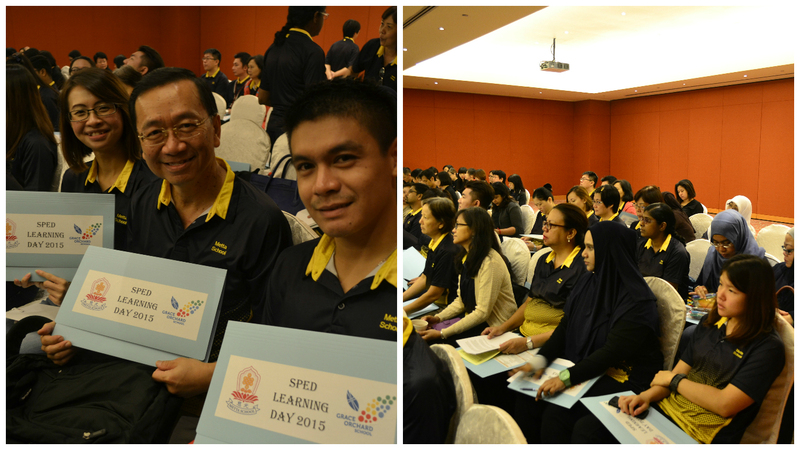 The SPED Learning Day 2015 was well –organised , informative and entertaining . The keynote sharing by Dr Ng Aik Kwang was an eye-opening experience for me. The concept of “creativity” came across to me as everyone can be creative . This is also true for students who are special educated. The concurrent session on UDL prompted me to relook at my teaching approaches to suit the learning needs of my students better. The concurrent session on CCE Lesson Study reminds me to appreciate the strengths of my students and not to always focus on their weakness. This is my first time attending SPED Learning Day & I am thankful to be able to attend the event as many others have put in a lot of effort to make it a successful event. I shared with the audience, mainly staff from GO on the topic “Using Graphic Organizer to help students with autism understand and respond to Wh questions: ‘who’, ‘where’, ‘what-doing’ and ‘what’. This is a study done by the PLT on 13 students with autism, aged 9-13 years old. Many were interested in how we carried out the teaching strategies and had requested to share our resources. It was encouraging to receive the positive feedbacks and I look forward to seeing more such sessions where we can exchange information and also on the possibilities of future collaboration. In the past conferences, we didn’t have the opportunity to share and collaborate with other sped schools/staff. This year, the activities/workshops with staff from other Sped schools which enable us to share and learn from each other. From the past Sped Conference to the presence, the best part is knowing that every year, staff are learning new things, getting new ideas and making progress so that we can give the best to our students. Through sharing, we realised we share the same stories about our students, our teaching and our journey with them. During SPED Learning Day 2015 concurrent session was my first time presenting to an audience who were unfamiliar. It was opportunity to improve and develop myself professionally in presentation skill. It was also a privilege for me also to share with other schools the strategies and approaches to enhance teaching and learning students with autism within a structured classroom to the Community with appropriate visual support. Thank you Mrs Liu for having the confidence in me and giving me the opportunity and last but not least, Masita for the support. As a first-time attendee of SPED Learning Day, I was rather uncertain of what to expect although several briefings were done prior to that. However, when I met the other teachers whom shared the same passion, it was very heartening to know that there are support networks all around. SPED Learning Day brought me through the journey on how Special Education has evolved over the years, and how it will continue to be enhanced through the many upcoming initiatives. Being able to meet our counterparts and learning from them was definitely a very fulfilling experience! I attended the SPED Conference for the first time on 16/9/15. In the morning, we attended a talk conducted by Dr Ng Aik Kwang. It was interesting as he highlighted the 4Ps of Creativity and Creative Problem Solving. I was inspired, seeing how the model of creative problem solving can be applied. I also learnt a lot from the session on UDL. Seeing how our brain functions and how UDL can be linked and applied, provided me a new and insightful perspective. Not to forget, the awesome food that we had. In all, the SPED Conference was a fruitful experience for me. “All children can learn…Just not on the same day or in the same way – George Evans” As a special education teacher, what’s your super power? Game & Activities planned according to the child’s needs, using different materials…Continue their sports activities outside school compound eg SDSC which lead our students to healthy lifestyle and community service. A very special day set aside for all special educators – really appreciate the learning moments and opportunities. The Health & Fitness session provides many workable creative ideas to help sped kids build up physical strength and to cultivate their interests in sports & fitness. The idea of morning run on weekends is very good- for social integration and meaningful lifestyle.